To judge by this site I’ve mainly been making videos lately (which is true and hey, check ’em out here) but that doesn’t mean I haven’t been growing and cooking and all those things I used to blog about. I have two basil plants in my Earthboxes, one Thai and one Genovese, which have provided me happily with fresh, incredibly aromatic basil all summer long. 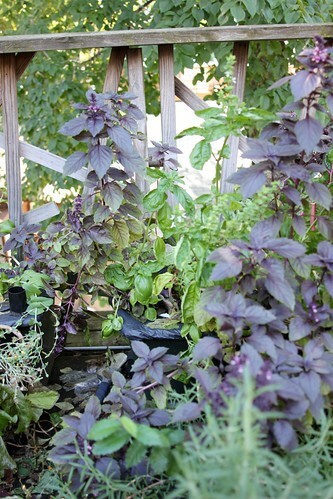 But sooner or later they’re going to freeze out there, so it’s time to preserve the fresh spring flavors of basil for the long Chicago winter. 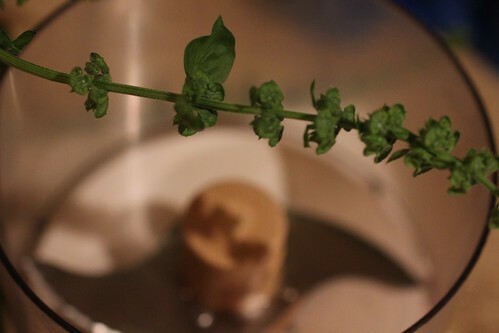 The most common way people preserve basil is, of course, as pesto— the simple combination of ground basil, olive oil, salt, garlic, pine nuts and parmiggiano reggiano or other good hard Italian cheese. 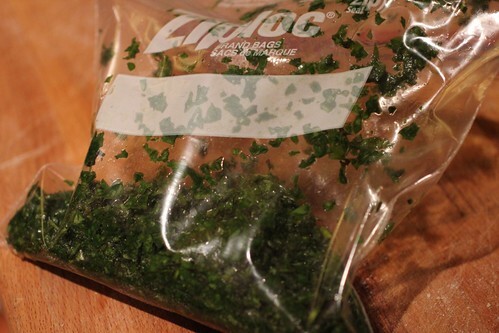 An old trick is to make pesto and freeze it in ice cube trays. Not a bad idea, but not a perfect one either, because you’re freezing things which don’t freeze well— garlic loses flavor, cheese’s consistency falls apart, and salt of course actively fights freezing. 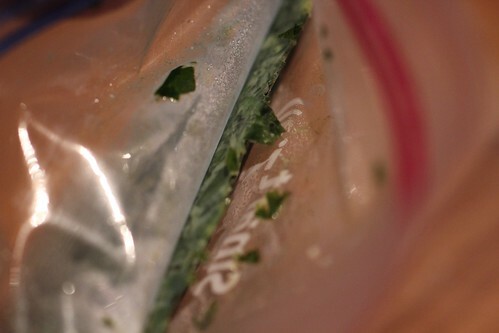 Here’s a method I arrived at that freezes only the part that really needs freezing— fresh basil— allowing you to preserve its aromatics. 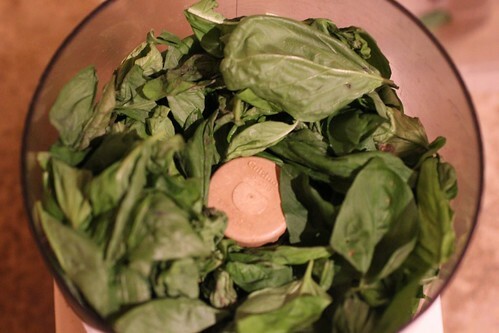 Then you can easily add the others, fresh, at the time you cook with them; the result is pesto in December that takes every bit as fresh and pungent as June. First, of course, pick a lot of basil— enough to fill your food processor bowl— wash it and then dry it thoroughly; you don’t want to freeze any more water than you have to. Pour in some olive oil. Not as much as you would use to make pesto; the goal here is to have just kind of an oily paste once the leaves are ground. 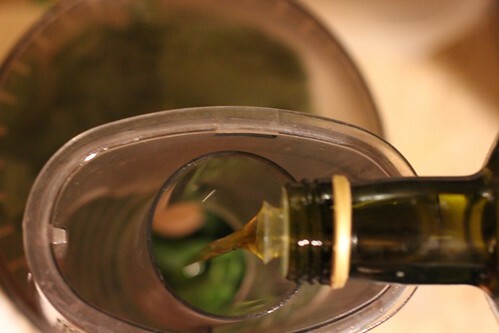 That way you can add fresh oil later; the point now is just enough oil to keep air out. Process the leaves. 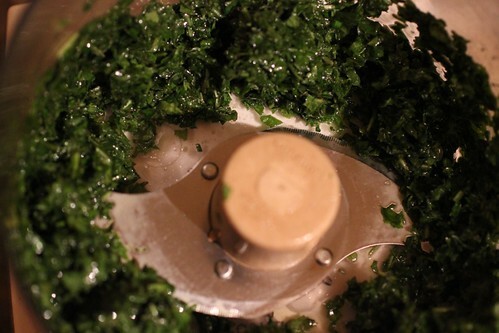 Since again, you’ll be making the actual pesto later, you don’t need to grind them as fine as in the final dish; just roughly chopped and coated with oil. …and press the air out and flatten it until it’s an even 1/8″ or so with as little exposure to air as possible. Boil a big pot of salted water. Boil the potatoes, strain them out, keeping the water. Boil the green beans, straining them out as well. If necessary, add more water, then boil the pasta. 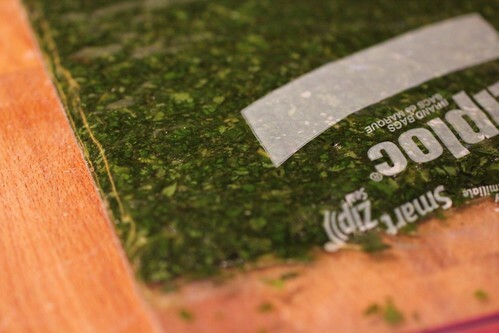 Take a spoonful or two of the hot pasta water and add to the pesto to loosen it up. 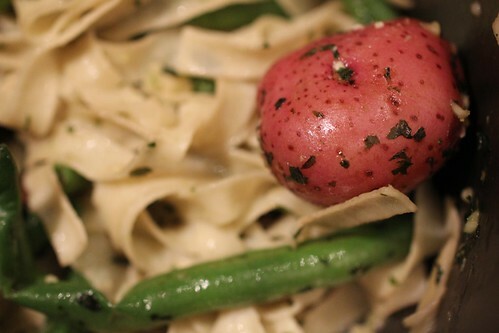 Drain the pasta and the pot and place the pasta back in the empty pot, then add the potatoes and the green beans, scatter the pesto as best you can around the pasta, and mix it all thoroughly until everything seems to have a coating of pesto. Serve in bowls.